If you are looking for a professional book to read this summer, read on. I recently finished a new one from Stenhouse called Who’s Doing the Work: How to Say Less So Readers Can Do More by Burkins and Yaris. There were many wonderful parts of the text that reiterated some of my firm beliefs about teaching reading. I’ll list some in this post and, hopefully, ignite your interest. I totally agree with the basic premise that as teachers we have to monitor ourselves so that we do not take on work that the students are capable of doing themselves. The authors use the four instructional contexts of reading aloud, shared reading, guided reading, and independent reading to show us how to let students take more control of their developing reading processing systems. Burkins and Yaris also make a strong case against the ‘leveling frenzy’ saying that some teachers are “blinded by levels,” not being able to see past levels to what the child can actually do as a reader. In chapter 2, the authors emphasis the benefits of reading aloud to children calling the read aloud time a “commercial for reading.” We should be setting kids up to want to be readers. Several classroom examples are given which show how students can participate in negotiating the meaning of the text. In the guided reading chapter, the authors remind us that the teacher must step back and let the students do the work as they problem solve words and make meaning of texts. I love that they call guided reading “independent reading’s dress rehearsal.” During these small group sessions, the teacher can see how students “apply all of their knowledge about how to read” while she is still there to intervene or support when necessary. Just as Terry Thompson says in his book on scaffolding, these authors remind us to “resist the urge to jump in and prompt heavily as soon as students have difficulty.”(p. 93.) 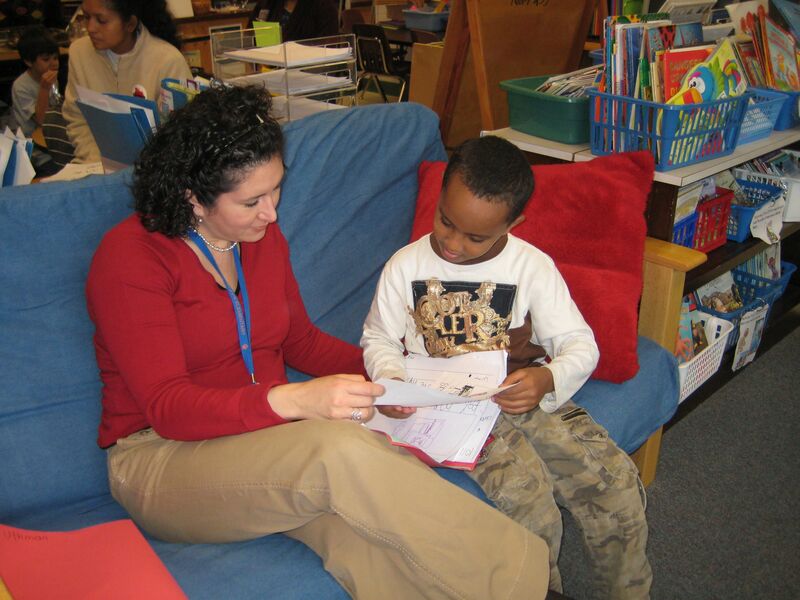 Kids should feel safe enough in guided reading to take the time to try different strategies to resolve problems. One major point of the whole book is that we should always be teaching towards the end goal of developing lifelong readers who CAN and DO read for pleasure and for information. The independent reading time is when students have plenty of class time to read books of their own choosing, books that match their interests and their abilities, without being restricted by a level number or letter. “If teachers micromanage independent reading time, they limit students agency and engagement and, consequently, limit the amount of work students do.” (p. 111). Early in the book (p. 28), the authors suggest we reflect on what we, the readers of this text, agree with and what we disagree with. To me that means that they encourage professional discussion on various topics, so I feel OK in mentioning two points that I question (‘disagree” being too strong a word). There is recurring mention throughout the text that ‘book introductions involve the teacher doing too much for the students.’ I tend to agree with Clay who says that students are “entitled to a book introduction.” I support the use of book intros (when done correctly) especially for students reading at beginning primary levels, K-2. I agree with these authors who worry that some teachers have misunderstood the concept of a book introduction and prime the students with too much information or pre-teach words. I also agree that a good book intro is NOT a page-by-page book walk. Katie and I present our views of book intros on pages 78-80 and 127-130 in Catching Readers Before They Fall. I’d also like to suggest that teachers look for a new book coming from Stenhouse within the next year on Book Introductions (no title yet) by authors Fay, Whaley, and Moritz. I think that book will help clarify any questions teachers may have. My other concern relates to the way that word solving is described in this text. Though the authors mention Clay and her three sources of information: meaning, structure, and visual information – they decide to combine two of those and only explain the Meaning and the Print aspects. I find this a bit misleading for teachers, however, I can understand that they were trying to simplify it for their readers. Again, the new book coming soon from Stenhouse will address the structural source of information. I hope my last two points don’t discourage anyone from reading this book because it is a valuable text. Rather, I included them so that all teachers will read with a reflective stance. We should always think and reflect on what we read in any professional text. I’ve been spending some time going through all my documents that I have saved on my computer. There comes a time when you have to just trash some things in order to make room for new stuff. What surprised me were how many things I came across that made me want to share an idea. I just couldn’t bring myself to press that delete button until I wrote the thoughts somewhere else. I decided that each time I came across something of value, I’d blog about it so that I, and my readers, could reflect on it one more time before I press that button. Today’s idea is from a page where I had taken notes on an article I read. In an article by Shari Frost in Choice Literacy a while back, Shari wrote about how distressed she was by the fact that many primary teachers were using their read aloud books for the purpose of strategy teaching and not just for the pleasure of enjoying a good story. Shari paraphrased another author (Patricia Cooper’s Language Arts article) who felt the same way. I found the quote valuable enough to copy down and save. How often do I use a picture book just for sheer enjoyment? Am I overusing what I know about strategy teaching by always thinking that my read aloud book has to have a strategy lesson attached? What messages am I sending to children about why we read books? Am I doing all I can to develop a love of books and stories with my students? Can I name three books that my students love to hear again and again just because they love them so much? Teachers shouldn’t have to defend WHY they are reading aloud great books to their students. We all know the benefits, don’t we? Recently I was doing some storytelling in my grand nephew’s third grade class. Prior to arriving, the teacher emailed me and said, “The timing is perfect for storytelling. We are working in writing on telling a good story.” I wondered if my storytelling would really connect with her writing lessons. But the more I thought about it, the more I could see the relationships the teacher would be able to draw from my telling of tales to the students’ writing. I knew that the story “Tinderbox” had some great descriptions, for example, the dogs that sat on top of the treasure chests – “one with eyes as big as saucers, another with eyes as big as dinner plates, and a third with eyes as big as cartwheels.” A good storytelling has plenty of descriptive passages because there is no book with pictures to show the kids. The kids create the pictures in their minds as the words flow from the teller. I also knew I would slow down the moment in “Tailypo” when the creature finally arrives in the old man’s bedroom – “He had the kind of feeling…you know the kind of feeling you get when something’s in the room with you…. then he heard some banging around the pots and pans…then he heard some scratching at the foot of his bed (pause). He stretched his neck and saw two pointed furry ears. (pause) Then he stretched his neck a bit more and saw two big fiery eyes staring up at him…” The more connections I saw between a good storytelling and the ideas for mini-lessons in writers’ workshop, the more I missed talking about writing to teachers. Since both my first book (One Child at a Time) and my second (with Katie Keier) deal with working with struggling readers, that’s usually the topic of my workshops when I am invited to school districts. But there was a time I talked to teachers a lot about all aspects of writing workshops, and I was seriously missing that! Lo, time to write a blog! Although I never authored a book on writing, I learned plenty from the masters. In my early days of teaching, I read everything possible by Lucy Calkins, Donald Graves, Shelley Harwayne, Georgia Heard, Ralph Fletcher, Carl Anderson, and Barry Lane. As new authors appeared on the scene (Katie Wood Ray, Jeff Anderson, Aimee Buckner, Kate Messner, Matt Glover, and many more) I read them too. After reading, I would try out lessons in classrooms; I would model lessons for teachers; I would confer with students about their pieces. My goal (in professional development workshops) was to share with teachers the essentials of writing workshop (time, choice, response, structure, and community) as well as lesson ideas they could take back to their classrooms. Two favorite lessons that teachers commented on were those I learned from Barry Lane’s After the End – “explode a moment” and “shrink a century.” So simple, yet such powerful revision tools. “Exploding a moment” meant teaching kids how to find a significant moment in their story and slow it down. Lane says, “the writer takes a sentence or two, and explodes it, scattering details all over the page.” When working with a student, Lane asked the child to “make the moment as long as he could, because the more he could describe that moment, the more the reader would become him and feel the impact of the story.” I remember having Lane’s words echo in my head as I worked with Ahmed, a fifth grader. Ahmed had asthma and was telling a story about an attack he had while playing with friends in his basement and couldn’t find his inhaler. He found the significant moment (when he rushed upstairs to his mom to find his extra inhaler) and he was able to slow that moment down so that his readers could feel his panic as his lungs tightened up and the pain in his chest throbbed. I met Mandy while walking to the bus stop. Blah, blah, blah. Most of this had nothing to do with the main point of her story. We were able to teach the students how to create a “shrunk-down sentence” instead. Though I absolutely still love supporting teachers with working with reading, I have to admit that just writing this blog brought back many memories of other discussions with colleagues about the teaching of writing in elementary classrooms (and my literacy geek friends – you know who you are!) If you are a fairly new teacher, I know you are reading some of the latest on the teaching of writing, but don’t hesitate to go back to some of those early books (they are probably gaining dust in your school’s professional library.) Just thinking about some of those books gives me goosebumps because I remember how inspired I felt. I felt inspired to help students write about a topic of their own choosing AND about something that really mattered to them. When I read a professional book with a powerful message I just have to shout it from the rooftops! This one’s a keeper. You may see the title and think, “Oh no, now they are pushing down the teaching of reading to pre-schoolers!” But don’t worry that’s not what this book is about. Kathy Collins and Matt Glover are talking about a different aspect of reading with preschoolers, kindergarteners, and first graders. 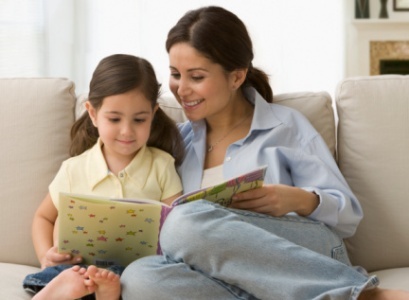 They realize that even before conventional reading and decoding words, children can be reading texts. 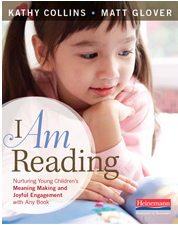 Their definition of reading is “an interaction with a text during which the reader uses a variety of resources within the text (words, pictures, graphic elements) and within themselves (schema, skills, strategies) to make meaning” p. 10. Their main purpose is to “help children love books, to read widely, and develop a lifelong enthusiasm for learning” p. 76. The authors talk about three categories of reading texts – familiar (like Pete the Cat that the children have heard many times), unfamiliar (books a child has never seen or heard read to him before) and informational books (any non-fiction book that the child is drawn to by the cover, pictures, or topic.) The focus of their teaching is how to read this type of book. Within each of the three categories they have come up with 3-4 language levels as to how the child reads the text. They have worked with hundreds of children to inform their decisions and provide you with ways to view videos of their work throughout the text. As they listen to children read, they think about the child’s level and then give us ideas of how to proceed and support each child further. I love the cautions they write about “leveling” as their view is similar to the one that Katie and I present in our Catching Readers book – “levels are tools for gathering information about children’s understandings rather than tools for labeling them” p. 30. Collins and Glover are teaching us how to support children in developing a healthy reader identity before reading conventionally. They are not deemphasizing the importance of teaching letters and sounds. They acknowledge the importance of that teaching. Here’s what they have to say about their expanded view of what it means to be a reader. This book presents a multitude of ideas for working with preK- 1st grade children (and ELL students in any grade). It answers the question, ‘what else can we be doing to support young children in developing an image of themselves as readers, whether or not they can read the words yet.’ When you read the authors’ belief system (p. 107-8) I think you will agree! I hope you enjoy the book. Recently I’ve been working with some volunteers who wanted to read with students in a first-grade classroom. Though the volunteers had some past educational experiences, they were not familiar with working with early readers, especially struggling readers. I had 45 minutes to share information with them and then each one watched me as I read with some students. With less than an hour to impart some knowledge, what would you choose to share? Learning about the three sources of information (meaning, structure, and visual cues) that students need to use when solving words was of utmost importance. Many parents and other volunteers might think that early readers solve words by “decoding” only (sounding out words.) We need to use the questions “Does it make sense?” “Does it sound right?” and “Does it look right?” so that students eventually internalize these questions and use them automatically. We want students to learn to cross-check one source of information against the other flexibly and fluently. For more information on this topic (in case you want to share this info with your volunteers) see Chapter 4, “Beyond Sound It Out,” in Catching Readers Before They Fall. Another big issue for volunteers is “when do I jump in and help when a child is stuck?” For this reason I talked a bit about prompting. We looked over some possible prompts from the Fountas & Pinnell book, Guided Reading: Good First Teaching for All Children, page 161. I wanted them to review some prompts for solving words, some for supporting fluency, some to encourage self-monitoring, and some just to get the students to be active and try something (even if the child couldn’t solve the word.) I also shared the strategic behavior card that you can find in Appendix 4 of our book. After all the prompting ideas, I did tell the volunteers that if the child made some sort of attempt or two, it would be OK to give the word. Having the child feel safe and comfortable with the volunteer is crucial. The teacher and I knew that, because of the population of students at this school, the individual attention would be beneficial for the students. Just having an adult listen to them read their familiar books would be time well spent. The volunteer could also read aloud a book to the student, especially if the child had been absent for some of the Read Alouds that the teacher had done recently. Language, language, language. Because many of the students they would be working with are English Language Learners, I stressed how important it is to have conversations with the students about what they are reading. Authentic conversations support vocabulary building as well as the student’s oral communication. The kids need someone who will carefully listen to what they have to say and work at understanding them. The Q/A chapter in our book, Chapter 11, may also help if you find yourself in a similar situation. The volunteers I worked with asked to borrow a book so that they could read through those suggestions. So what would you do if you had only 45 minutes to train your classroom volunteers? What’s your top priority? After taking some time to work in upper elementary classrooms, I have returned to volunteering in a first grade classroom. Since I did Reading Recovery for 7 years, this is where my heart often returns to. I am absolutely loving my work with these little guys! But because I only see them once a week I want to be sure I’m using my time as expertly as I can. Therefore, I looked back in Clay’s texts to make sure my teaching is as effective as it can be. I find I can open to just about any page of a Clay book, read a few paragraphs, and I am filled with food for thought. I’m going to copy a list of Clay’s (see bottom) that got me thinking in hopes that you too will spend some time reflecting on it. Perhaps you’d even like to take the list to a team meeting and get some discussion going. Clay believes (as do I) that every reader must build their own self-extending reading process system. (You can read more about this system in Chapter 2 of Catching Readers Before They Fall.) Some children do this very naturally no matter how they are being taught to read. But with children who struggle (beginning readers or those in upper elementary grades), they need to be scaffolded as they build that system. The aim of all teachers of reading is to produce independent readers – readers who work at problem solving, fluently and flexibly; readers who self-monitor themselves; readers who self-initiate their own strategies and behaviors and don’t wait for the teacher to prompt, etc. “ – if early behaviors are appropriate, secure, fast and habituated. – if children learn to monitor their own reading and writing. – If they search for several kinds of information in word sequences, in longer stretches of meaning, and in letter sequences. – If they discover new things for themselves. – If they check that one kind of information fits with other available information. – If they repeat themselves as if to confirm what they have read or written. – If they correct themselves, taking the initiative for making all the information they find fit the word they decide upon. Marie Clay, Literacy Lessons Designed for Individuals, Part Two, Page 114. Am I making sure the students are monitoring for meaning and not just to see if they ‘got the words right’? Am I giving them time to search and time to problem solve? Or am I jumping in too quickly? Am I modeling the many ways they can search and gather information from the picture, the sentence, the meaning of the story, how the letters look, etc? Am I encouraging rereading which will help them confirm, or check, or redo a word choice, or discover something new? Am I sending the message (in all that I do and say) that it is their job to do the reading work? Do I encourage them to check and confirm for themselves instead of looking to me for confirmation? There are just a few of the questions I want on the tip of my tongue as I work with first graders. I hope they inspire some reflection in you also.